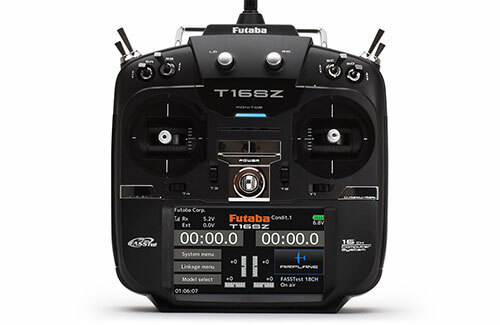 All Products > "Search Results"
The Futaba T16SZ is a mid to high-end radio that finds itself standing out in the middle of the Futaba range. 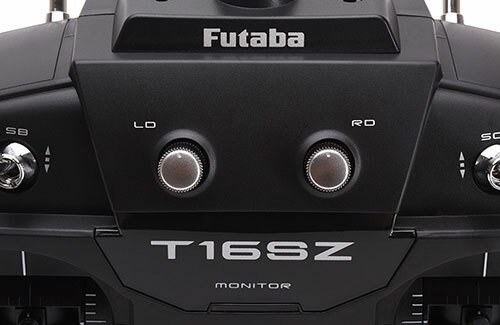 The T16SZ is a noticeable step up from the T14SG but brings in the DNA of its higher specification sibling the T18SZ. Packed to the brim with features (listed below) and with up to 16 channels on offer it is hard to think of any model that can't be setup with this stunning radio. Navigating through the menu screens is simple thanks to the large 4.3" colour touch screen. Just like a mobile phone it is extremely responsive and does not need pressure to operate. To back up the screen there are also two physical buttons, one to open the menu and one to return. 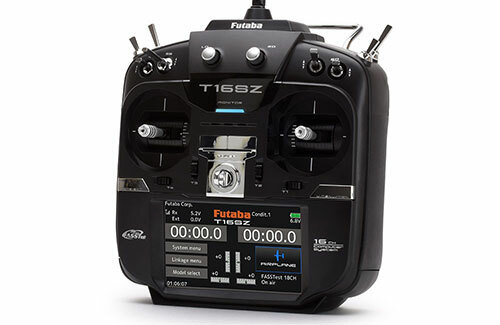 To offer the most versatility the T16SZ is compatible with FASSTest, FASST, T-FHSS and S-FHSS systems. 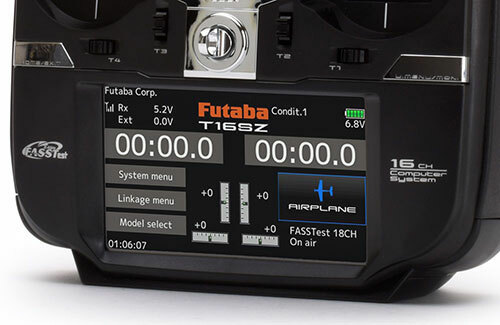 Using FASSTest and T-FHSS systems you can monitor numerous telemetry data in real time on the screen from Futaba's ever growing range of sensors (available separately). 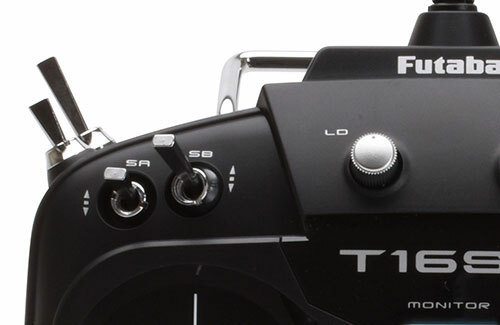 This means you can buy the right type of receiver to suit your model and budget. The case is moulded with a stunning deep satin black finish accented by polished silver buttons and switches. Even the power switch is high quality with a dual power button design. Dual buttons have to be pressed together to turn on/off the power helping to avoid accidently turning off when adjusting trims! 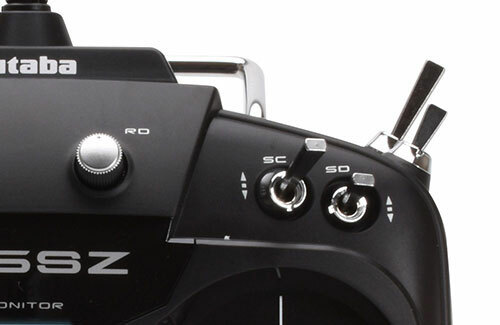 A center speaker is hidden with three sleek slots enabling voice feedback during use but there is also an audio jack in the back for those who prefer to use headphones. The trims are digital as you would expect from a radio of this quality and are assignable to any channel. 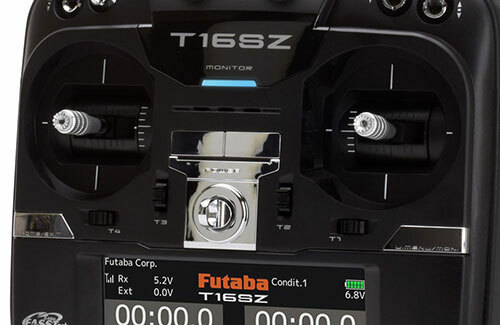 The switches are exactly the same quality as the top of the range T18MZWC and you can move them to other positions in the same way. For a finer touch there are two rotary dials in the center for variable adjustment. An adjustable aerial is mounted prominently on the top for the best signal possible. 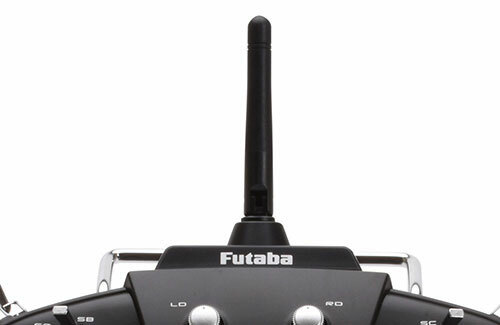 A Futaba R7008SB is included in the box as the perfect matching receiver. 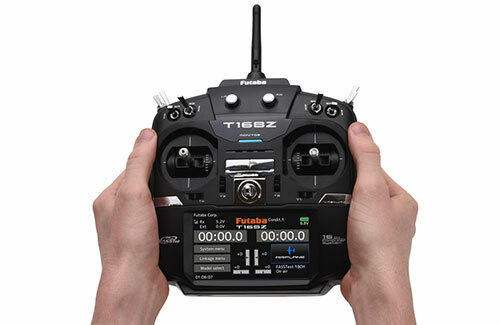 The Futaba R7008SB is a FASSTest telemetry diversity receiver, capable of high-voltage use an operating up to 8 channels using the 8 standard PWM outputs or up to 18 channels (16 proportional + 2 digital) using the S-Bus port. 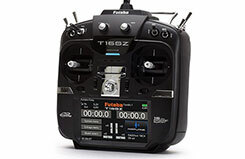 A 6 volt Ni-MH battery is included with 1700mAh capacity, plenty for most pilots. If you do want more capacity or a spare then you can also upgrade to LiFe for extended duration (P-FT2F2100B sold separately).